You might not know it at first glance, but Google's new Gmail interface is jam-packed with powerful possibilities. Ready to uncover some interesting new stuff? 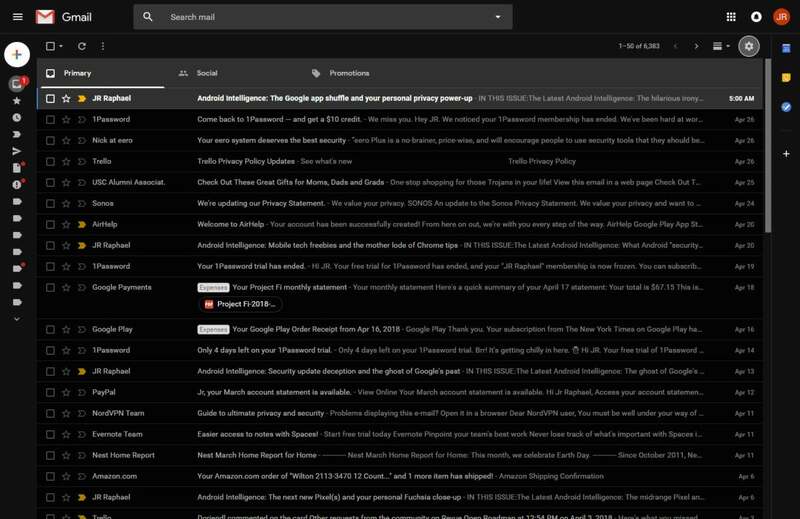 The first thing you'll probably notice about Google's newly revamped Gmail is that, well, it looks and feels an awful lot like the old Gmail. Sure, Google's updated email interface has plenty of polish and some noteworthy new elements. On the surface, though, it seems decidedly familiar. And trust me: That's a good thing — and quite a feat of design. 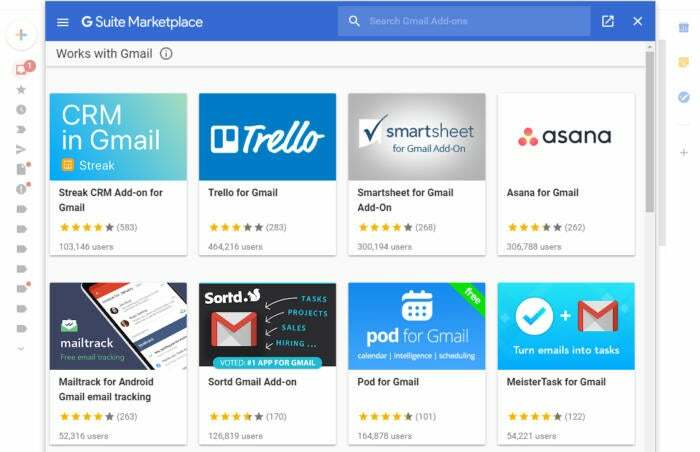 But don't let yourself be fooled: The new Gmail is actually overflowing with options that can simplify your workflow and make your inbox easier to manage. Here are 25 worthwhile tips for getting the most out of Gmail's latest incarnation. 1. Want a little less clutter — and a little more space? The new Gmail lets you collapse the left-of-screen panel that holds all of your labels and categories. Just click the three-line menu icon (a.k.a. the "hamburger menu") in the upper-left corner of the screen, and the panel will shrink down into a narrow list of icons. It'll then automatically expand whenever you hover over it, so you'll still be able to find what you need. 2. Check out attachments right from your inbox — without ever opening a message. By default, the new Gmail shows tiles for every file associated with an email right below the email's subject line. All you have to do is click on a tile to open or preview the file's contents and get directly to the info you need. 3. The downside to those tiles is that they make emails with attachments appear larger in your inbox, since their lines become taller and thus also more visually prominent. If you aren't a fan of that — and don't mind losing the one-click attachment access — you can disable the icons by clicking the gear icon in the new Gmail's upper-right corner and selecting "Display density." Switch the view from "Default" to "Comfortable," and Gmail will go back to the older method of indicating attachments (with a small paper clip icon at the right of a message's line). 4. For an even more compact inbox — with less padding and more dense information — try out the updated "Compact" view in that same "Display density" menu. 5. 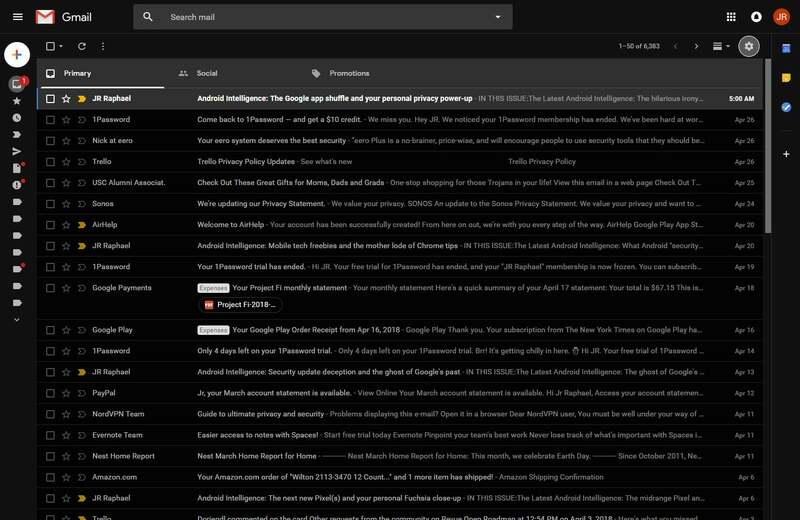 Wishing the new Gmail had a dark theme? It actually does: Just open up the gear icon in the upper-right corner and select "Themes." There, you'll find a variety of colorful options for jazzing up your inbox along with some more muted options, like plain dark, high-contrast, and the pleasingly subdued soft gray. 6. Step-savers, take note: When you hover your mouse over a message in your inbox, the new Gmail will give you a series of quick-access actions at the right side of the line. You can archive the email, delete it, mark it as read or unread, snooze it (more on that in a minute), or even RSVP to a meeting request right then and there. 7. Ever like marking messages as unread after you've opened them? The new Gmail makes that easier than ever to do: Anytime you have an email open, look for the envelope icon directly to the right of the trash can in the horizontal row of icons above your message (in the area directly beneath the search bar). That'll let you mark the message as unread with a single click. (In the old Gmail, you first had to click the "More" button to find that command.) If you've already closed the email, you can hover over it and click the "Mark as unread" icon, as mentioned in tip 6. 8. The new Gmail will soon have an automatic and native offline mode — meaning you'll be able to open the standard Gmail website and read and write messages, even if you don't have an active internet connection. (Presumably, this will work only if you (a) are using the Chrome browser, (b) are signed into your Google account, and (c) have accessed Gmail from that same computer before.) That's a significant improvement over the old system, which required a separate extension and then used an awkwardly stripped-down mobile-like interface in place of the regular Gmail environment. Google says the native offline mode will arrive sometime in the "coming weeks." 9. Snoozing is one of the most useful tools to make its way into the new Gmail. Instead of letting messages linger in your inbox and pile up to an unmanageable point, use the snooze function to help yourself deal with everything as soon as you see it: If you can respond to something in less than a minute, do it. If something doesn't require any action on your behalf, archive it immediately. And if something requires some sort of action but you don't have the time to mess with it at that moment, snooze it to a day and time when you will be able to handle it. Snoozing a message causes it to vanish from your inbox and then reappear at any day and time you choose. As noted in tip 6, you can snooze an email from your inbox by hovering over the message and selecting the clock-shaped Snooze icon. To snooze an email that's open, click the Snooze icon to the right of the envelope icon in the row of icons at the top of the page. Your inbox will be less cluttered, more organized, and more manageable as a result. 10. The new Gmail makes it possible to snooze multiple messages at the same time — in case you see more than one email that needs to be pushed back to the same point. From your inbox, simply click the boxes to the left of any messages you want to include, then click the clock-shaped icon in the horizontal row of icons that appears at the top of the screen and select the day and time you want. 11. Need to get back to something you snoozed — or change the day and time at which it's set to reappear? You can always find all of your snoozed emails in Gmail's new "Snoozed" section, directly beneath the "Inbox" line in the left-hand panel. Once you're there, just hover over any email and click the clock-shaped icon to change its snooze settings or unsnooze it entirely. 12. You can snooze messages from the Gmail mobile apps, too, though the option is a bit buried. From the inbox view, press and hold a message to select it, then tap the three-dot menu icon at the top of the screen and look for "Snooze" in the list of options that appears. If you've already opened the message, tap the three-dot menu icon on that screen; you should see "Snooze" show up as part of the options there as well. 13. The new Gmail will always suggest times for you to snooze a message: On the desktop interface, it offers "Later today," with an evening time; "Tomorrow," with a morning time; and "Next week," with a morning time. Depending on the day of the week, it might also offer "Later this week" and "This weekend" options, both with morning times. The mobile app presents those same choices along with more general "Morning," "Afternoon," or "Evening" options after you've selected a custom date. If you don't want to use one of the preset times, you can always choose the "Pick date & time" option. Here's a little secret, though: You can actually customize what times Gmail uses for each of those preset options. There's currently no setting for that within Gmail itself, oddly, but open up Google Keep and then click "Settings" in its left-hand panel. See the fields for "Morning," "Afternoon," and "Evening"? Enter in whatever times you want for each day-part, then click "Save." Refresh your Gmail tab, and there you have it: The times you selected will now be used for the same respective day-parts there — and in the Gmail mobile app as well. 14. The panel at the right of the new Gmail interface lets you pull up Google Calendar, Google Keep, or Google Tasks right inside your inbox so you can manage info from each of those apps without having to switch tabs or open anything new. With Tasks, you can even drag messages from your inbox into the panel to create new tasks around them. Unfortunately — and somewhat strangely — the same drag-and-drop behavior doesn't presently work (in either direction) with Calendar or Keep. Another glaring omission is the lack of any panel-based presence for Google Contacts, which seems like an obvious element for on-screen access. If you have Gmail keyboard shortcuts enabled, however, pressing "g" and then "c" will open up Google Contacts in a separate tab — so at least there's that. 15. Google Tasks is kind of confusing, given the fact that it overlaps considerably with Keep but lacks many of the most basic task management features (things like support for sharing or collaboration, the ability to create recurring tasks, and the ability to create meaningful reminders). Tasks also doesn't currently integrate with Google's cross-product reminders system. But! You can have any items you create in Tasks show up in your Google Calendar — if you know how to do it: Open up Google Calendar and look under the "My calendars" section in the site's left-of-screen panel. You'll probably see a line there labeled "Reminders." Tap it and then select "Switch to Tasks" from the menu that appears. Then just make sure the box next to that line is checked and active, and your dated tasks will automatically come through and show up on the appropriate dates. Just be aware that by doing this, you'll lose the ability to have any reminders — those set via Keep, Google Assistant, or the Google search box — appear in your calendar. For whatever reason, it's a one-or-the-other decision. 16. Tasks doesn't integrate directly with the Gmail mobile apps, so if you're planning to use it, you'll want to get the new standalone Tasks app for phone-based access. It's available on both Android and iOS. 18. 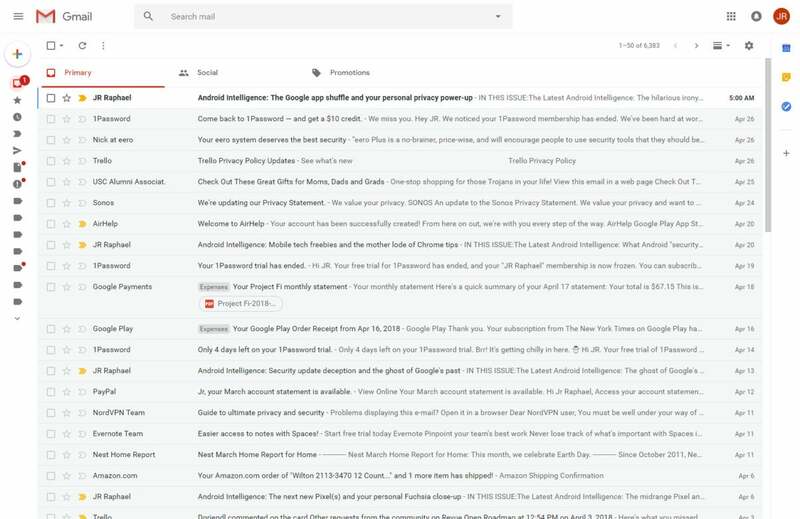 Privacy-seekers, stand by: The new Gmail will soon gain the option to make messages expire after a certain period of time as well as the option to recall already-sent messages. Both features will work by sending the recipient only a link to the actual content, not the content itself (though the recipient could obviously still capture and save anything via a screenshot). A related feature, using that same system, will allow you to prevent someone from forwarding, copying, downloading, or printing your message (though again, there are plenty of ways to get around that — but the main use-case here seems to be avoiding any accidental sharing of sensitive info). And finally, you'll be able to protect a sensitive message with a two-factor authentication code — delivered via text to a specified number — if you really want to make sure only the intended recipient is able to open it. None of this is at the level of security a fully encrypted email app like ProtonMail will provide, of course, but it should be a nice bit of added protection for more everyday sorts of needs. 20. Remember Gmail Labs? 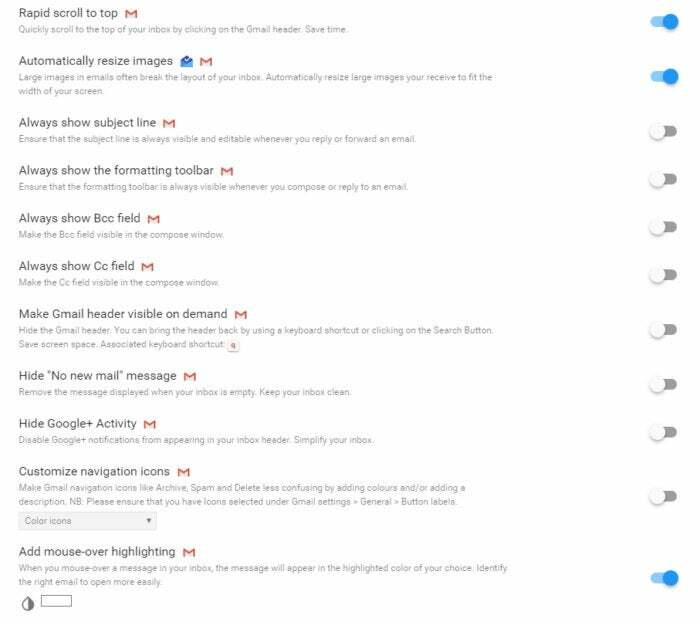 That's gone in the new Gmail, but you can find many of the same options in a newly added "Advanced" section within the site's settings. Click the gear icon in the upper-right corner of the screen, select "Settings," then select the "Advanced" tab at the top of the screen. Useful features such as templates, custom keyboard shortcuts, and the ability to turn on an Outlook-like preview pane await. 22. Give your fingies a break with Google's Smart Reply feature, which officially makes its way from the mobile app to the desktop with the new Gmail. Just look for Google's suggested responses — presented in white tiles with blue text — at the bottom of any email you're reading. If any of those suggestions seems like a response you want to send, click it; Gmail will then start a new reply and place that text inside the message for you. You can edit the text or add to it, if you wish, and send your message on its way in no time. Gmail's Smart Reply feature can take the words right out of your mouth (maybe, sometimes). And in case you're wondering, by the way: There's no way to turn off Smart Reply altogether on the desktop as of now. You can, however, disable it in the Gmail mobile app by looking in the account-specific section of the app's settings. 23. Speaking of the Gmail mobile app, watch it closely over the coming weeks for some handy new features. An option to receive notifications only for "high-priority" messages — those that Gmail deems to be important — should be showing up soon. The app will also soon start offering up one-tap links to unsubscribe from newsletters or other mass mailings you don't seem to be interested in receiving. And unofficially, signs suggest that the Android Gmail app is poised to start providing a way to customize what happens when you swipe left or right on a message. 24. Just like in the old Gmail, remember that you can change how your inbox looks and works. Hover over "Inbox" in the left-of-screen panel and click the down-facing arrow that appears next to it to peruse the available options (important messages first, unread messages first, etc.) — and if you're using the default tab-based setup, look for the "Manage your inbox settings" link in that same area to pick and choose which tabs you want included in your inbox's organizational structure. 25. Craving even more features and customization? Grab Gmelius, a new-Gmail-ready browser extension that gives you all sorts of extra native-feeling options — including the ability to schedule emails, add private notes into emails, and delete trackers from incoming messages. Gmelius also has some handy tools for cleaning up and enhancing the Gmail interface. It can automatically resize large images in messages so they fit within the width of your screen, for instance, and it can add a mouse-over highlighting effect to make it easier to see exactly what message you're hovering over in your inbox. It can even remove the footer info at the bottom of the Gmail site and hide the Google+ notification bell at the top. Gmelius works with Chrome, Opera, and Safari. Its main features are free to use, with some limitations (like a cap of five scheduled emails per month), or you can opt to pay $60 a year for unlimited access to all of its elements.